Back in June, Nick & I went to my little cousin Charleigh's birthday party (remember the Strawberry Cupcakes?) Charleigh's parents, grandparents, and friends put out quite the spread (very impressive for a 1st birthday). I spied these little skewers on the appetizer table and had one of those "Isn't that smart!" moments, vowing to make them for our next shindig, and every other time I wonder, "What should I make for this crowd to nibble on?". One bite, unmessy, unfussy, easy, and incredibly delicious. And who doesn't like to eat party food on a stick? (If you put the mozzarella on the end stealth Vegans can just bite in front of it, then give the cheese to their neighbor! Or replace mozzarella with a marinated mushroom cap or spinach leaf). 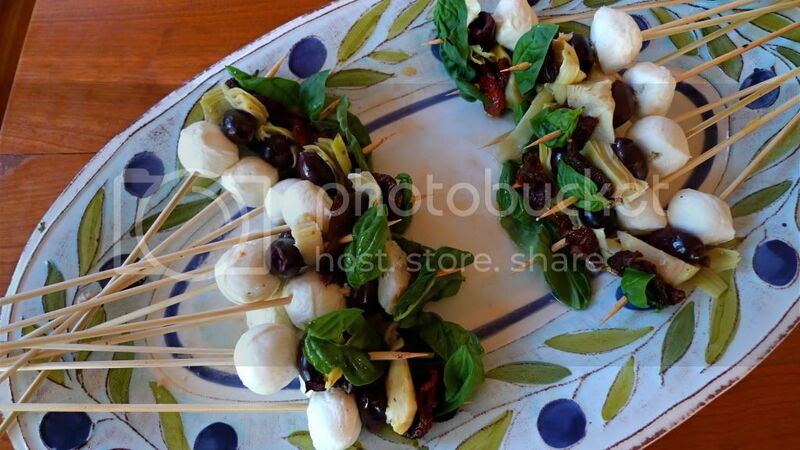 This isn't rocket science, just skewer together your favorite antipasto nibbles. Charleigh (and I) chose fresh mozzarella balls, kalamata olives, marinated artichoke hearts, sundried tomatoes, and fresh basil leaves. Just string everything together! The mozzarella does dry out quickly so assemble just before serving.